With the leftover eggplant from the Eggplant Barley Risotto, I felt compelled to play with Indian spices. Have you cooked with curry powder? The smell, alone, drives me crazy and I can’t wait to dig in! Then it colors the remaining ingredients with such a beautiful golden orange! Oh man, I’m making myself hungry, again! In a large skillet, sprayed with non-stick cooking spray, over medium heat, add the garlic, chopped onion, and green pepper. Cover to steam vegetables, until onion begins the become translucent. Add the remaining ingredients. Stir thoroughly, raise the heat to medium-high, and recover. 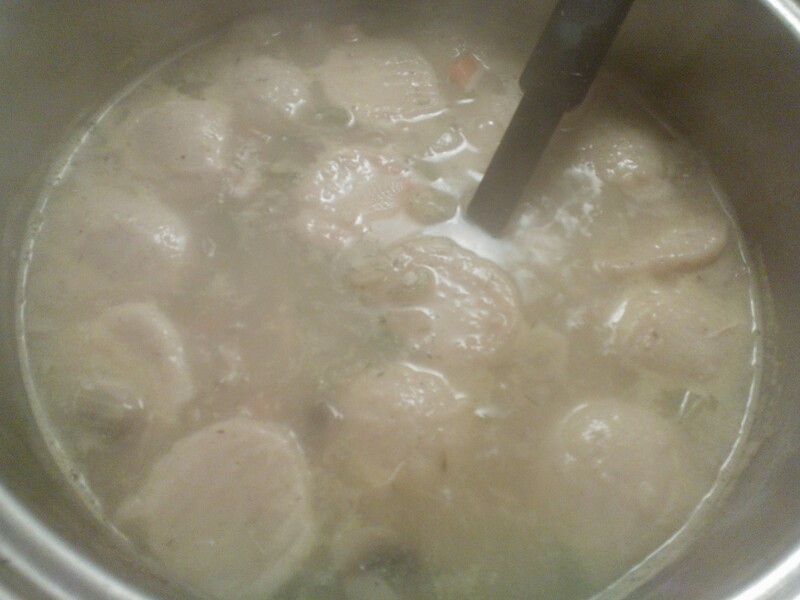 Continue to cook, stirring occasionally, until liquid evaporates, about 10 minutes. This was such an easy, one pot meal! Gotta love it! I have been having way too fun with fiber! 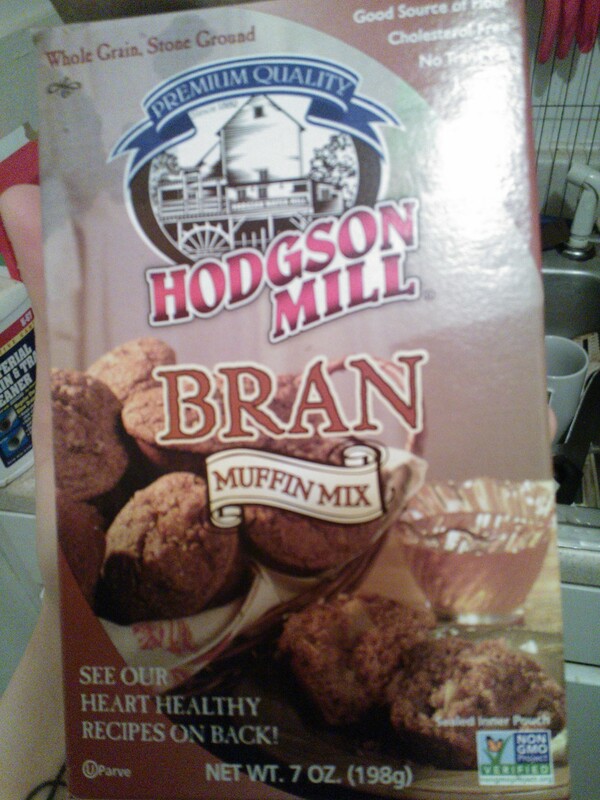 It began a few weeks ago with making some bran muffins. 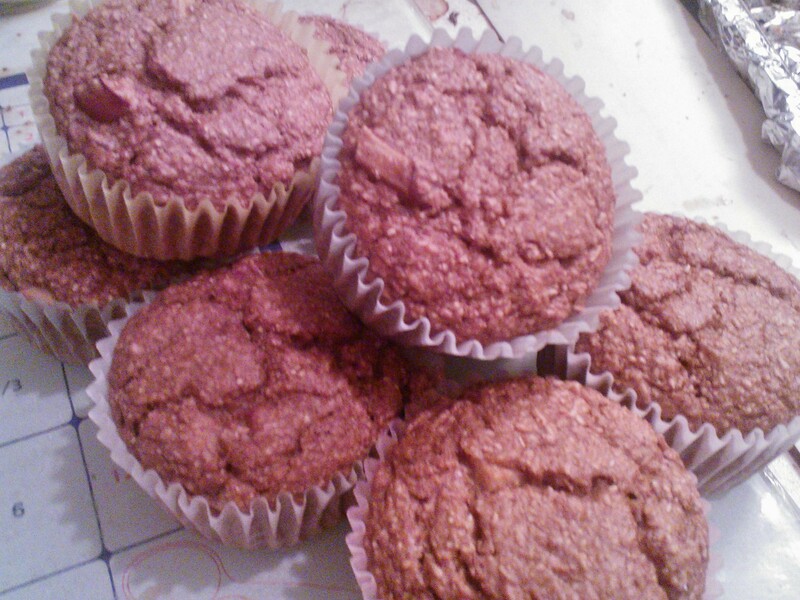 Then, this beautiful pear from my Harry and David package was staring at me and I decided to make Pear Spice Muffins! Fan-Tastic! Preheat oven to 350F. Chop the pear into bite-size pieces. Combine all ingredients and half the chopped pear. Once thoroughly mixed, fold in the remaining pear and divided amongst 8 cupcake tins, lined with cupcake paper. Bake for 15 minutes and enjoy! Dad and I adored the end result! He kept taking them to work for an on-the-go breakfast. I warmed one up at work and spread a little PB on top and the spread melted and it was fantastic! 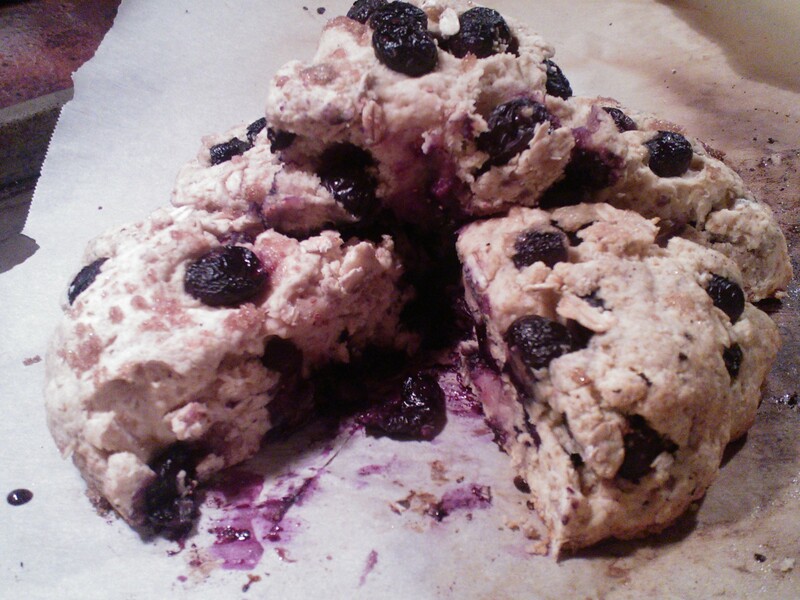 Last night, after making two batches on Blueberry scones, I really went into baking mode! I zested 1 lemon, with the zester dad got me for Christmas, and combined it with powdered sugar, and enough warm milk to make a glaze. Wow! Genius! I love lemon and blueberry! A few days ago, I began to make my own crackers… yes…. crackers… and dad? He loved them! “I need to put these away before I eat the whole bag!” he said. 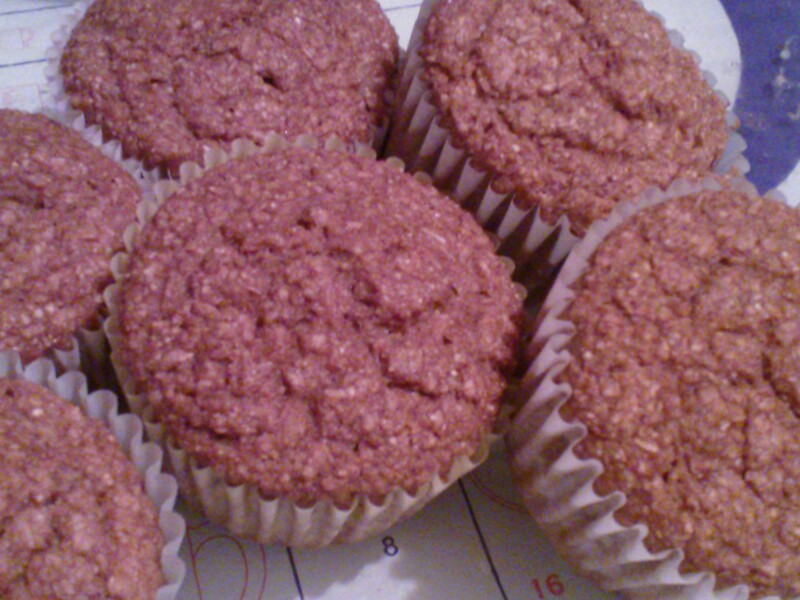 The first time I made these, I used ground flax. 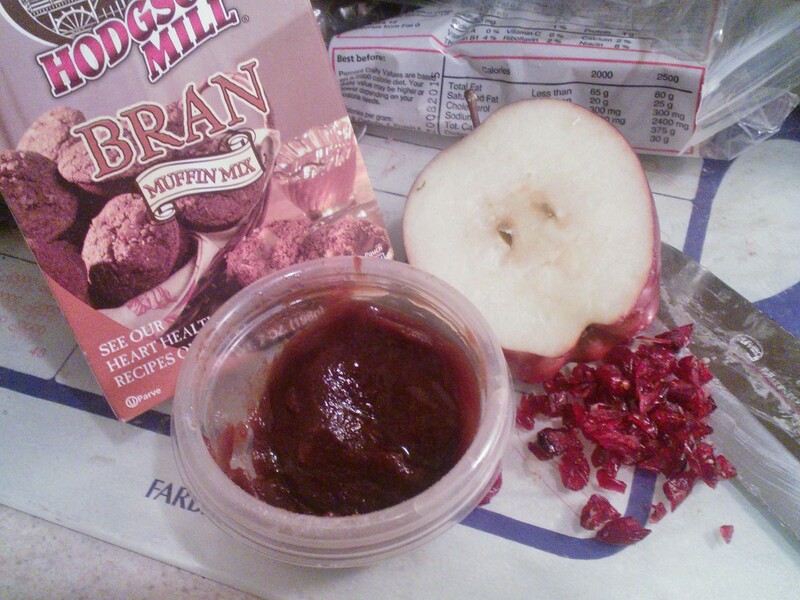 This last batch, I used milled bran. Preheat over to 350 F. Mix all ingredients together and spread into a thin rectangle on a parchment paper-lined baking sheet. Bake for 5 minutes. Remove from the oven and slide a sharp knife over the sheet of fiber to cut 8 strips across and 6 horizontally (Sorry, guys, I’m pretty bad at dimensions). Return to the oven for an additional 5 minutes. Remove from the oven. By this time, the squares are formed enough to be broken. 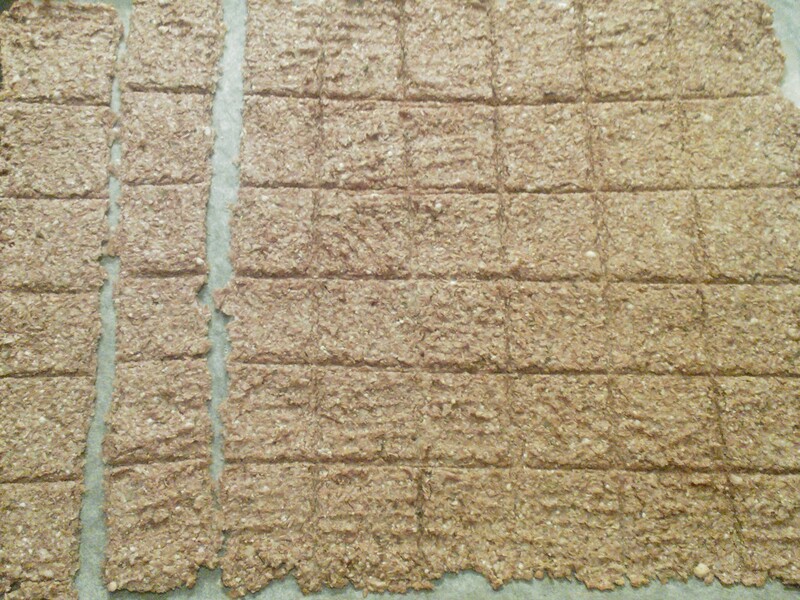 Break up the sheet into 48 separate crackers and return to the oven for a final crisp (5-8 minutes)! I’m seriously hooked! They go with everything! Salsa, peanut butter (of course), fresh fruit… I even crisped these up more and broke them into my salad as croutons! Well, being on this bran kick, and in quite a baking mood, I went with the flow and after 2 batches on scones and a batch of crackers, I made another batch of bran muffins. This time with apples (and apple butter)! Preheat over to 350 F. Combine all ingredients! Divide amongst 8 cupcake tins, lined with cupcake wrappers. Bake for 15 minutes. Dig in! Can you guy what dad’s breakfast was, this morning? Fiber is freakishly filling, fun, fiberful, fit, and makes you feel fabulous! Talk about a recipe overload! PS. The muffins freeze really well! I have really been trying to embrace healthy carbs, lately, such as whole grains. I have always loved barley. I remember being a little kid and stealing the barley out of my moms chicken soup pot. I remember the chewy texture sucked me right in! I was on an oatmeal kick, last year, and then heard of quinoa bowls. I made one for breakfast one morning and thought how great of an idea it was to switch out my oatmeal and top this grain with berries! Then I heard of breakfast barley bowls, which I, still, have yet to try! But, today, I bought a bag of barley and I’m ready to rock! With an eggplant on the discount rack and a bag of cauliflower in the freezer, I was more than ready to try Julie’s barley risotto. 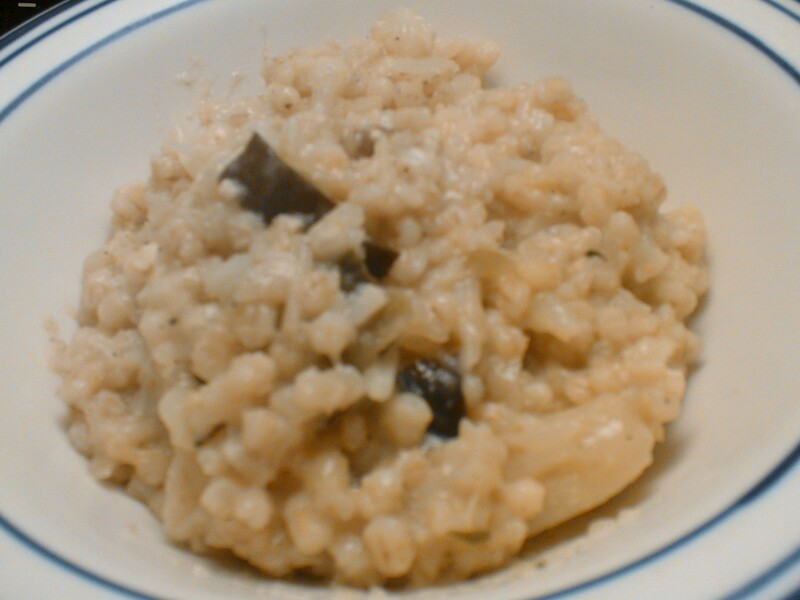 I’ve always had risotto made with rice and I have heard that it is rather difficult to make. Bring it! Heat the oven to 440 F. On a baking sheet, lined with parchment paper, spread the eggplant and sprinkle with Italian seasoning. Roast int heat oven for about 8 minutes. While the eggplant is roasting, Add the onion and garlic to a large pot, cover, and simmer over medium heat, until the onions start to sweat. Add the barley, along with 1 cup of broth. Bring to a boil. 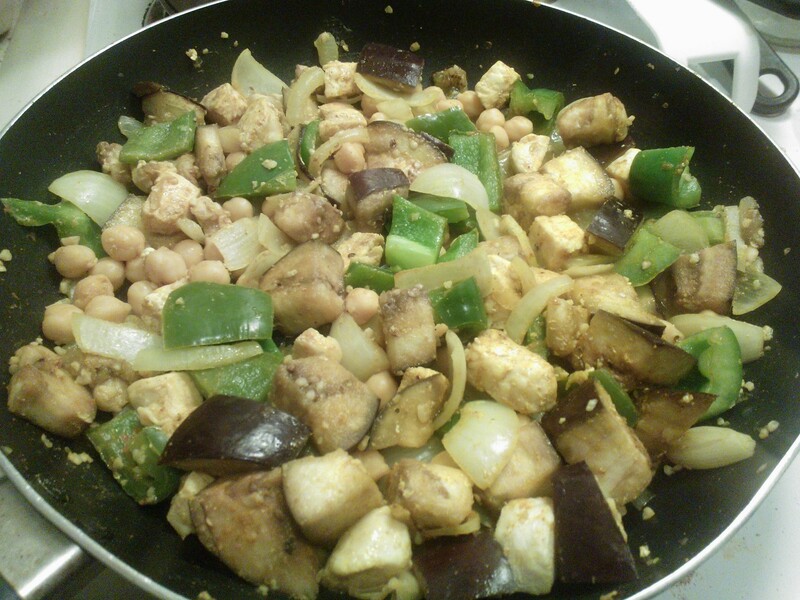 Add the eggplant and frozen cauliflower. Cover the pot, lower the heat to medium high. Stir the pot frequently. As the broth is absorbed, add another cup of broth. Once the last cup of broth is added, add the thyme and granulated garlic. Stir until spices have been disbursed. Lastly, add the cheese wedges and stir. Turn off the heat. Sprinkle the parm in a little at a time, stirring constantly. Each serving is 3/4 cup. If you’re really hungry, this dish can be divided into fours! Damn I love barley! I’m already planning another barley dish! Stay tuned! Probably one of my things about cooking with fresh berries is when they are heated. They BURST! Today is National Blueberry Pancake Day! Rather than sharing another pancake recipe, I wanted to share a recipes bursting with the blue stuff! 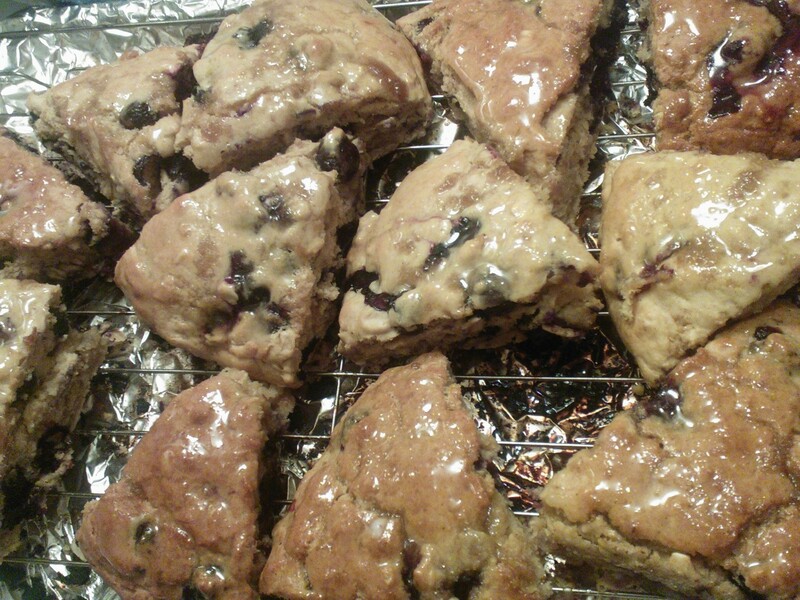 Well I couldn’t sleep that night, and decided to utilize the remaining berries to play around with scones. My brain wouldn’t stop coming up with proportions for ingredients until I got up to bake! The end result was beautiful and tempting! After two attempts, and the improving results, I gave it the “third times the charm.” Yum! But, nonetheless, there was still improvements to be made and on the four shot, I fell in love! Spread the buttery spread on a piece of wax or parchment paper to a 1/4 in thickness and freeze for 2 hours, at minimum. Preheat the oven to 400 F. In a bowl, combine the oats, pastry flour, Bisquick, 1 Tbsp Splenda brown sugar, cinnamon, Splenda packet, baking powder, and salt. In a separate, small bowl or cup, whisk the vanilla, powdered creamer, milk, and egg substitute until powdered creamer has completely dissolved. Using a fork, break up the frozen butter into smaller pieces and quickly and thoroughly mash butter into the flour mix, until the mixture resembles coarse crumbs. Add the applesauce, and whisked milk mix. Fold in the blueberries. Transfer the dough to a parchment paper lined baking sheet. Form into a circle, about 7 inches in diameter and flatten the top. 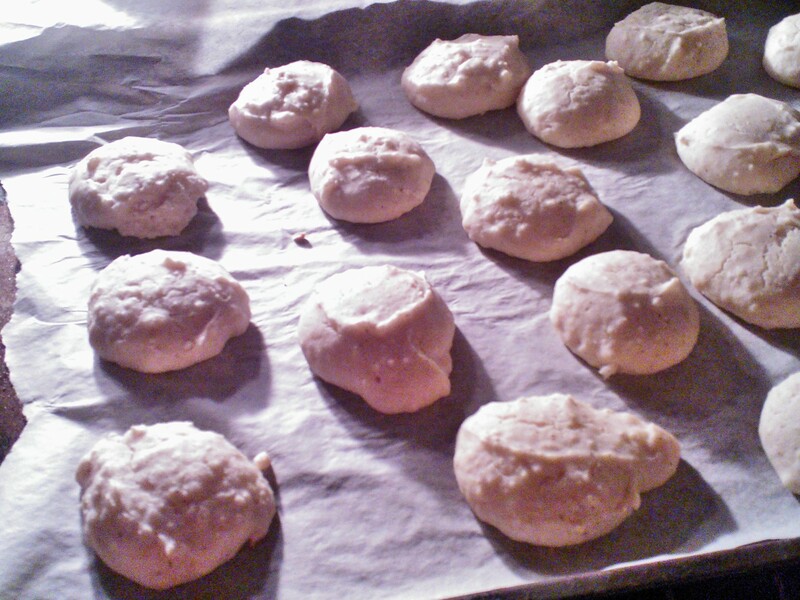 Bake for 5 minutes and remove from the oven. Using a large, sharp knife, slice the pastry into 6 sections. Sprinkle the last 1 tsp of Splenda brown sugar over the top of the crusty dough. Return to the oven and bake for an additional 15 minutes. Remove from the oven, slice along the previous cuts, and let cool. Enjoy! If your feeling adventurous, top it with a glaze! 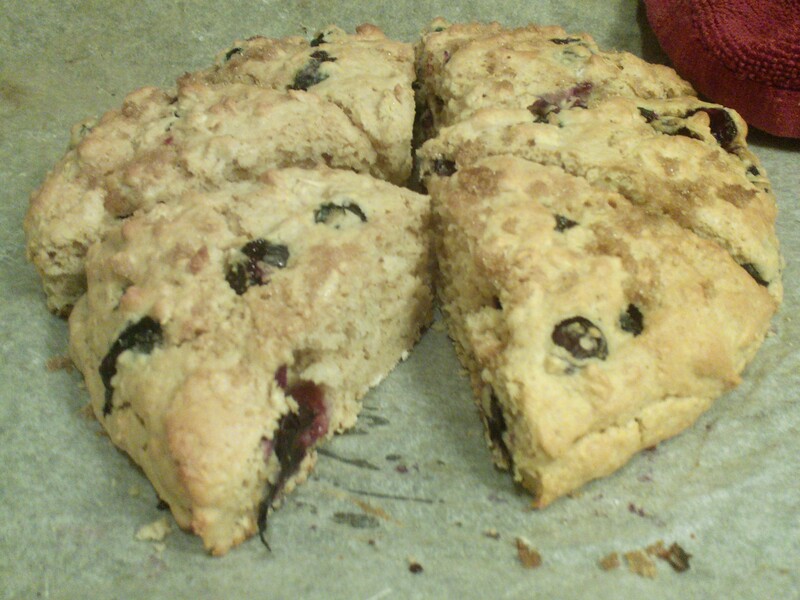 I loved pulling the scones out of the oven and seeing the skin of the blueberries thinning, fighting back, not to explode the berry goodness everywhere. 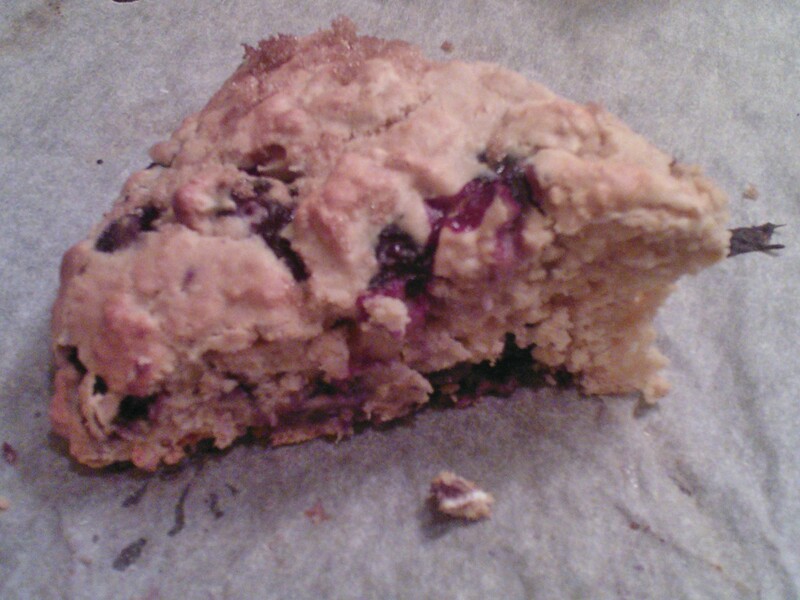 I found myself sneaking warm blueberries off the scones! 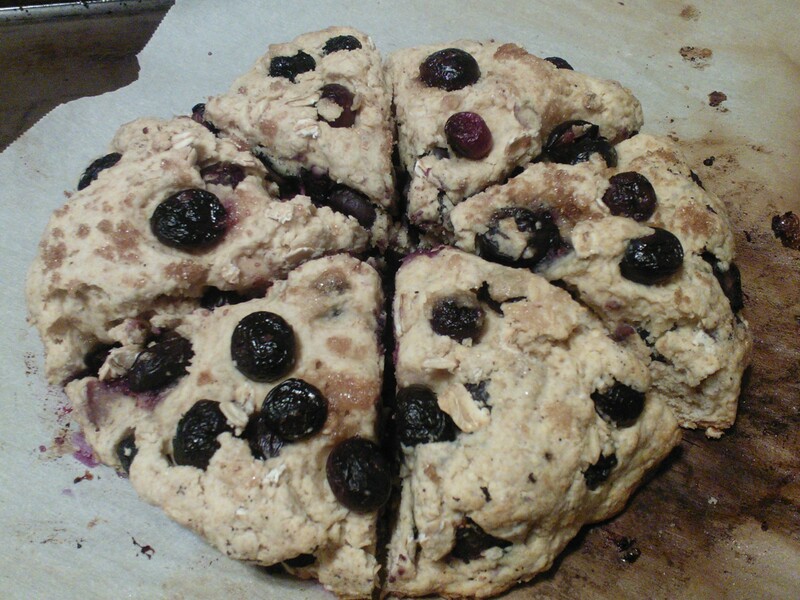 No, Sammy, if you eat out all the blueberries, they would be blueberry scones, anymore! They were packed solid with blueberries! 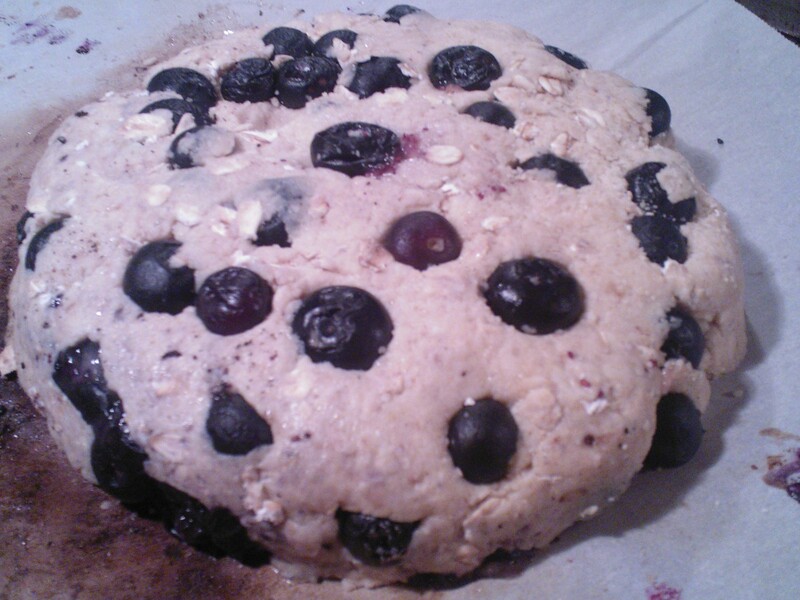 Plus, the little sweetness from the brown sugar crust just accentuated the berries! They contain more antioxidants than any other fruit, and are also good sources of vitamins A and C, calcium, potassium, iron, and magnesium. 1 cup of blueberries contains 5g Fiber. The pterostilbene in blueberries enhance immune function when combined with vitamin D, according to a study by Oregon State University. 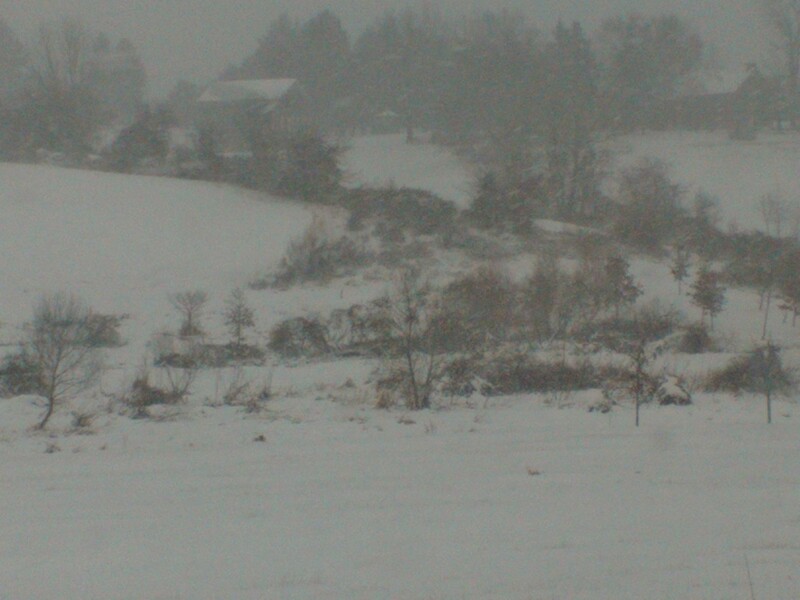 Between the snow, rain, and wind, I had to drive home through the thickest fog I’ve ever driven through! Visibility was about 10 feet! Driving home from work has been pretty dangerous! 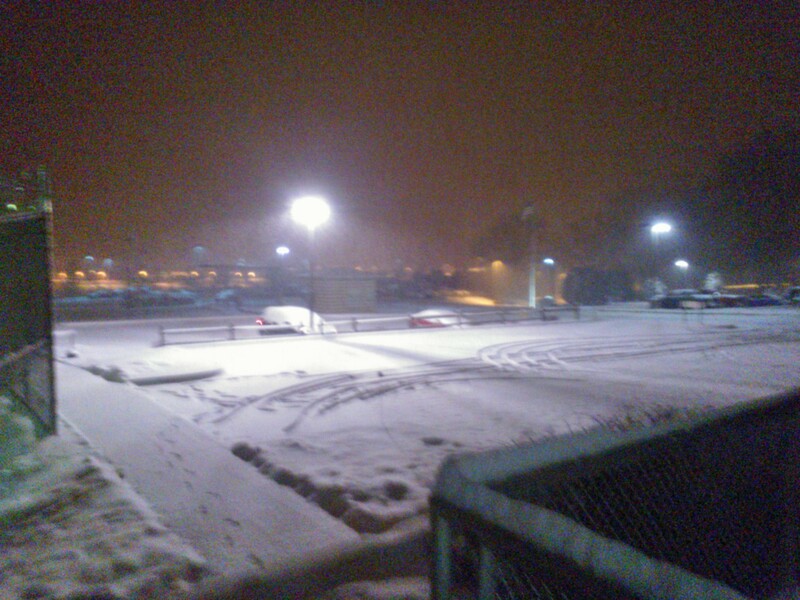 The night before, it had snowed its but off and I drove 15mph all the way home! But today was most extreme of them all! The threat driving home this morning was black ice, but the temperature was even more dangerous. When I left work this morning, I left with two jackets on, two hoods, gloves, a scarf, and sweatpants over my scrub bottoms. Why? Because it was 3 F! Yes, THREE DEGREES!!! And that was just the air temperature! The wind chill? 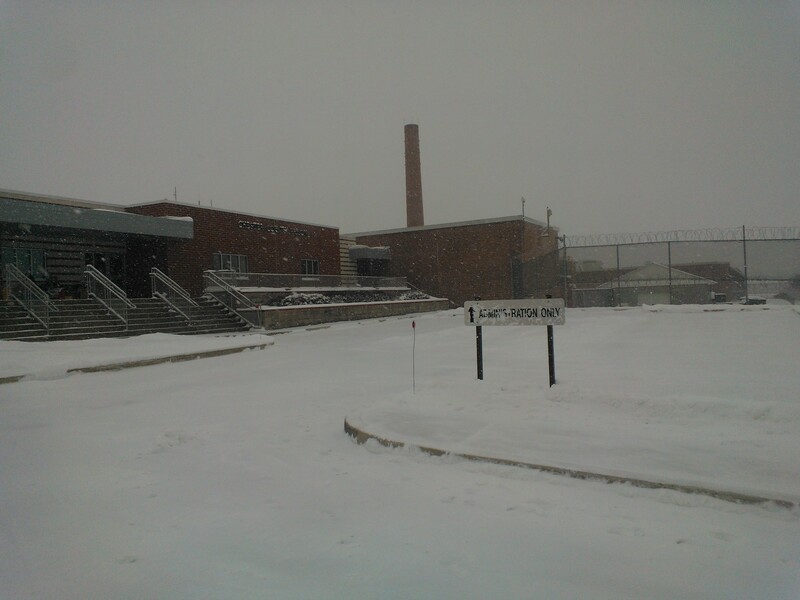 Oh, just -17 F! I’ve been bundled up, even in the house! Dad thinks its hilarious that I sleep with my pom pom hat on! Lucky for me, I’ve been whipping up lots of warm goodies in the kitchen! Oh, and the forecast tomorrow? -14 F! Just great! On the plus side, I’ve been keeping warm with yummy foods! I’ve been hanging out at dads place alot and my eating has been great! I think its because I’m having what are called “meaningful meals.” When you begin refeeding after an eating disorder, they say to have “meaningful meals.” This means to eat meals consciously, carefully, and with meaningful people. For about 2 weeks now, I’ve eaten three meals a day and snacks! What an accomplishment! Work is going well and I’m even eating meat,again! I eat some sort of protein at least once a day! This is a huge breakthrough for me! For instance, I organized the freezer and found two 10 oz pork loins. Which I used immediately! 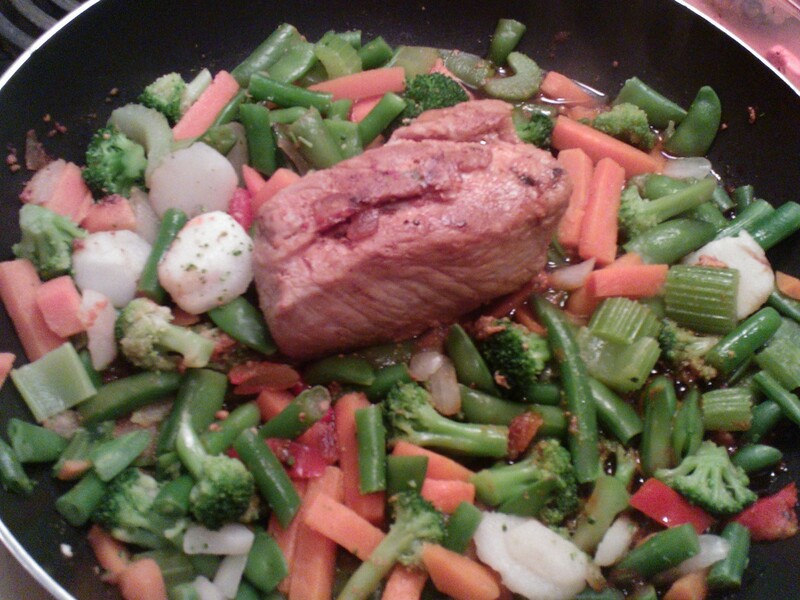 One night, I marinated the loin in hot pepper jelly, cooked the loin and used the juices, along with teriyaki sauce and red pepper flakes to make a stir-fry! The following night, with a jar of roasted red peppers in the fridge, and a sale of frozen veggies at the store, I was still craving pork! I seasoned the last pork loin with Italian seasoning and thyme, and while steaming it, browned the outside of the loin. Once cooked through, I removed the loin and let it rest. 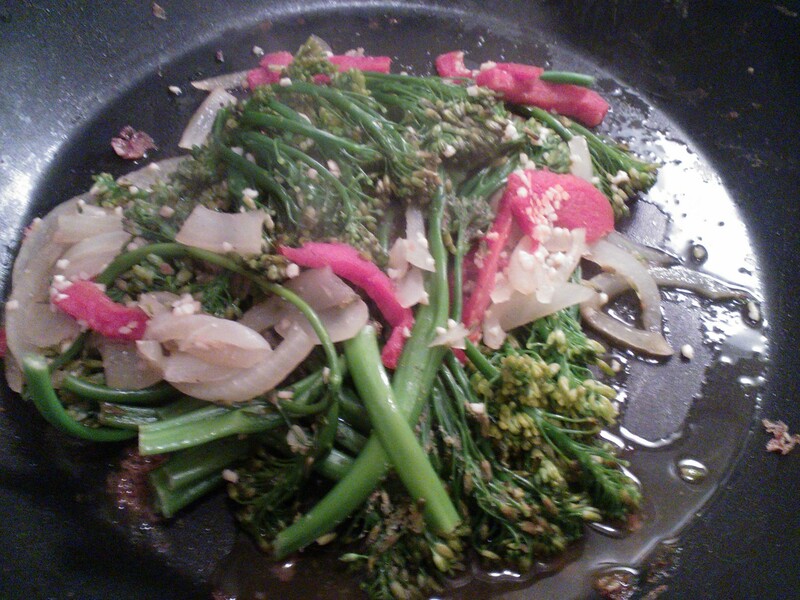 I added a box of chopped frozen spinach, thinly sliced onion, garlic, seasoning, and sliced roasted reds to the pan. 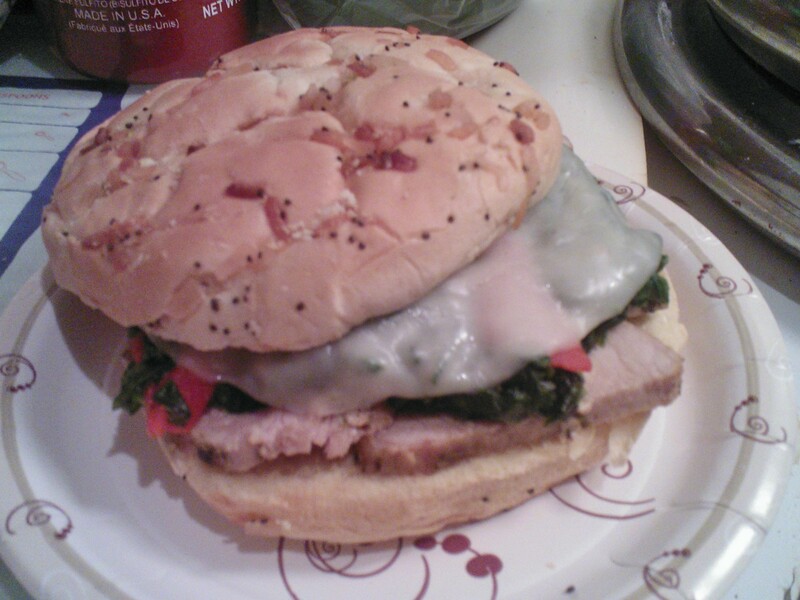 I thinly sliced the resting loin and I ate my meal out of bowl, and made a tasty porchetta sandwich with melted light provolone for pops! YUM! I have picked up quite a few shifts at my new job and today I realized I am finally getting the hang of things! At first, I was constantly behind and never even got a chance to eat! Today, however, was completely different! I ate breakfast, lunch, got done everything I needed to do, not only on time, but early! Plus I went to Zumba! It was a really good day today! Backing up a bit, I just had to share some pictures with you. 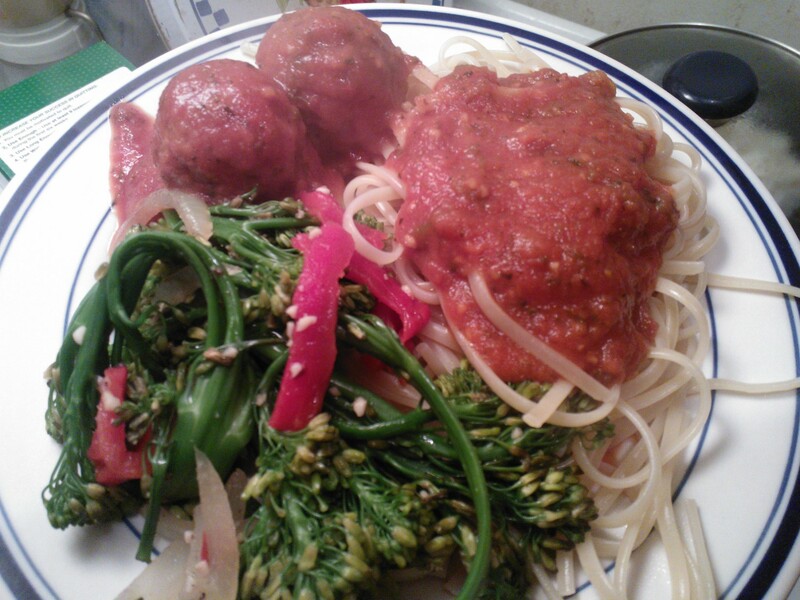 On National Spaghetti Day, January 4th , I whipped up some gravy, with a side of steamed broccolini, onion, and roasted red pepper. It was a beautiful and delicious meal! On my pay day, I took Barry out to breakfast and treated him to the “Ich Liebe Dich” Omlete! It was massive and tasty! I, of course, ordered my banana fosters coffee to pair. 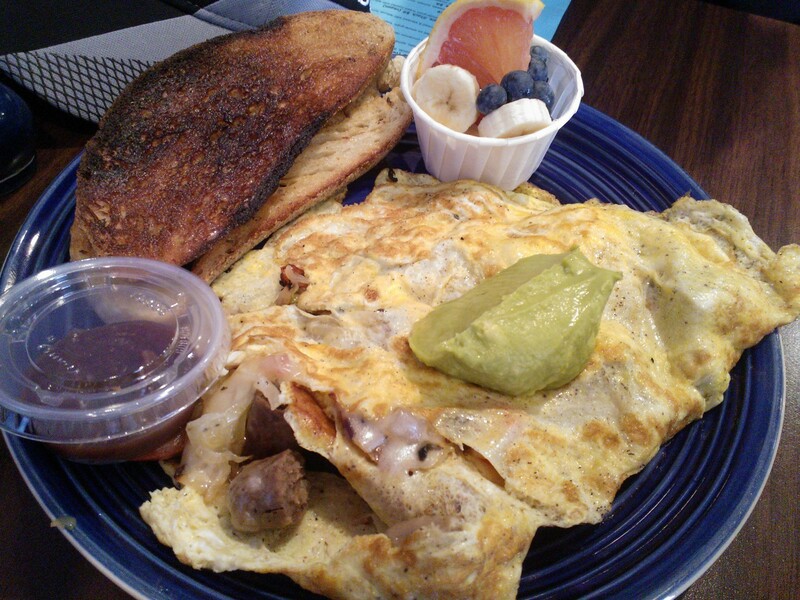 The omelet was stuffed with sausage, smoked cheddar, sauerkraut, onion, and bell pepper, topped with a dollop of guacamole, with a side of toasted sourdough, apple butter, and fruit. And “just because,” we ordered the Vegan Peanut Butter Fudge Pudding Cake! 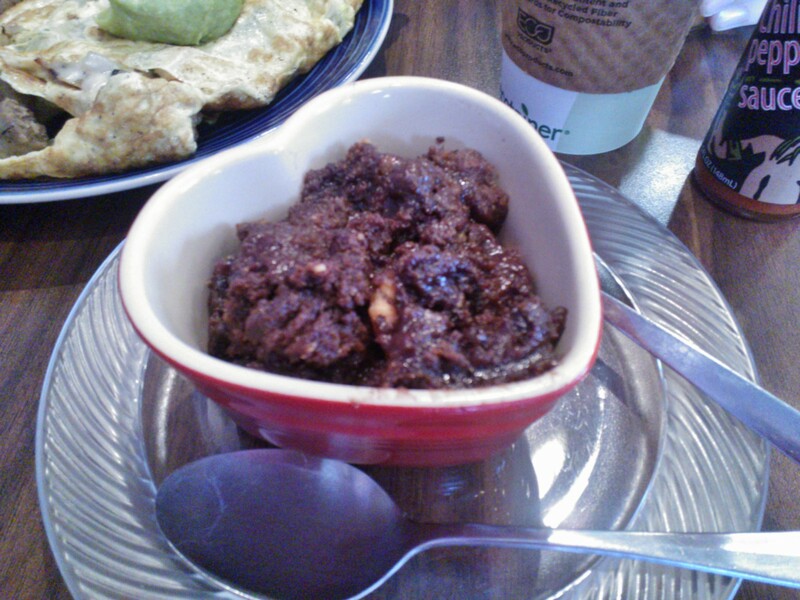 Talk about dense and rich, and we couldn’t get enough! It was quite the combination of ingredients to make our Friday breakfast! 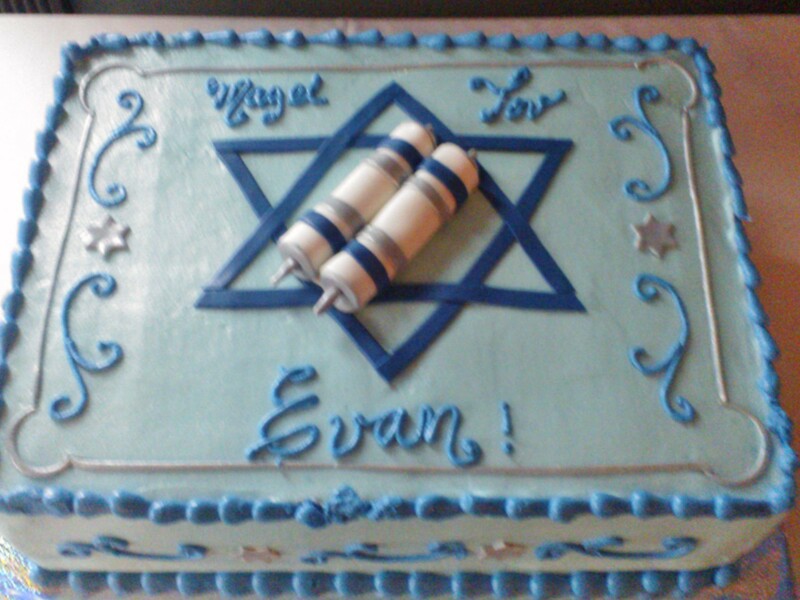 That Saturday, the family celebrated the Bar Mitzfah of Frank’s nephew. It was the first Jewish celebration I had attended actually in Temple. The cantor had a a fantastic voice. I wanted him to serenade me with Frank Sinatra music. Haha! The Rabii took me by surprise, as she was female! I did not know that females could be Rabbis. It was definitely a new experience, as I tried to sing the hymns and and follow along. Following the two hour ceremony, we drove about 10 minutes to the luncheon, that was more like an afternoon of food! It was like a 4 course meal! 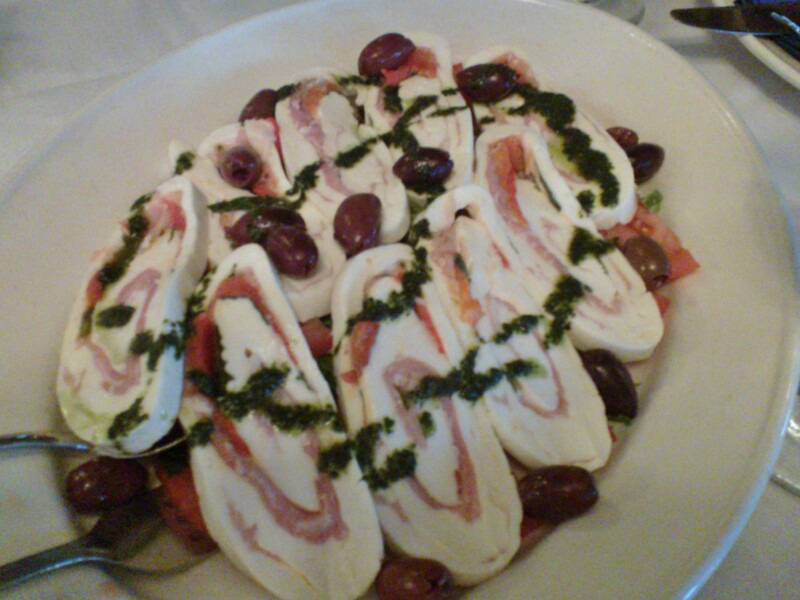 It began with appetizers of fried calamari, eggplant rollatini, and mozzarella rolls stuffed with prosciutto and roasted red peppers. the Eggplant was my favorite! This was followed by salad and penne a la vodka! I kept picking out the peas! It was delicious! The waitress took our orders. James, one of my brothers, and I could not decide between the chicken and the bass so we decided to split! 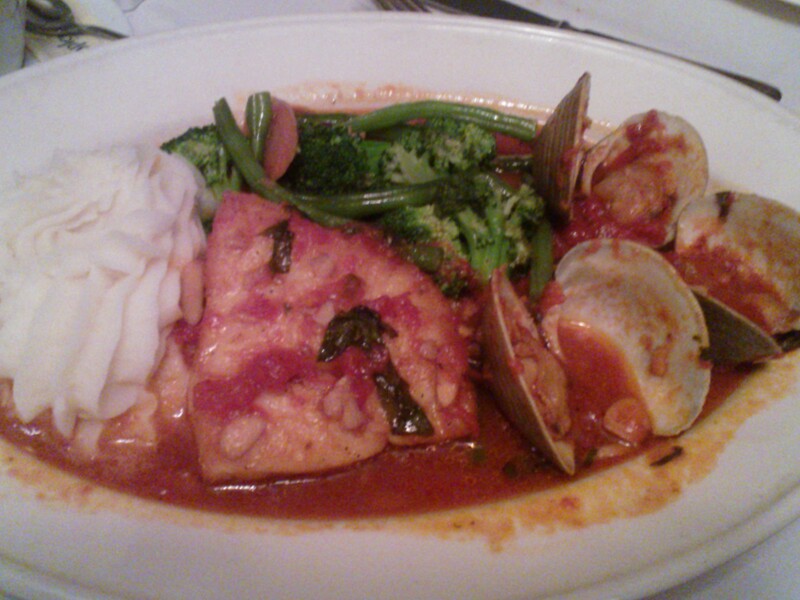 I ordered the chicken piccatta with double veggies, and James got the Chilean Sea Bass. 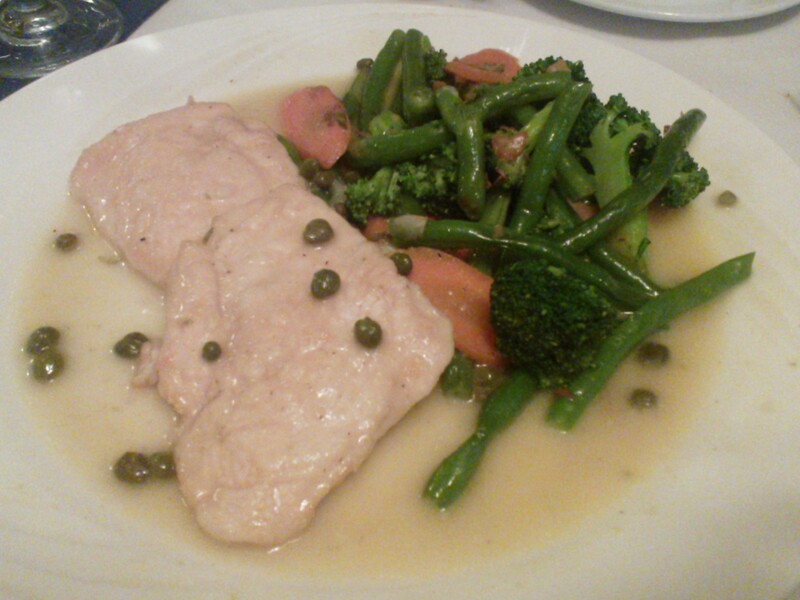 The bass was perfectly cooked and I loved the lemon of the piccata sauce! 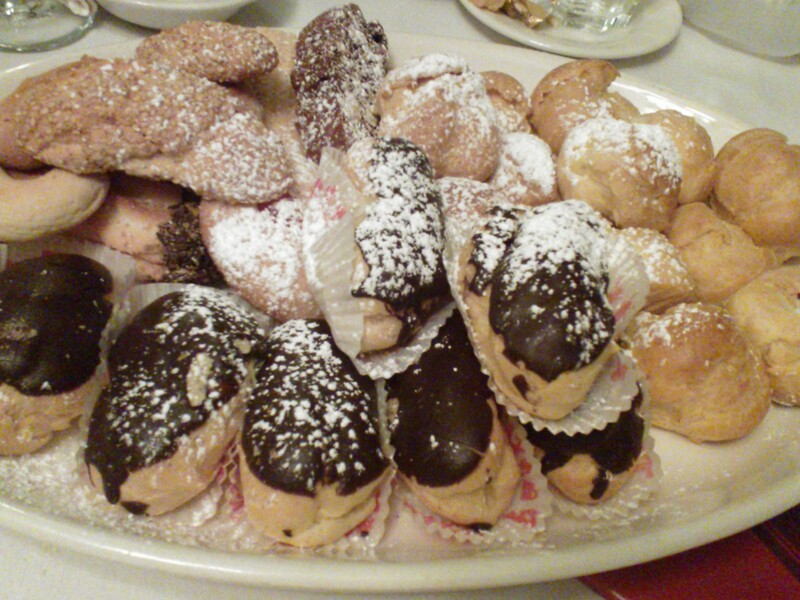 Dinner, as if that was not enough, was followed by an array of cookies, pastries, and the above cake, which was spectacular! I am not an icing girl, but I would have licked the cake clean! Despite a day filled with food, I was incredibley proud of my self control, portions sizes, and overall eating! 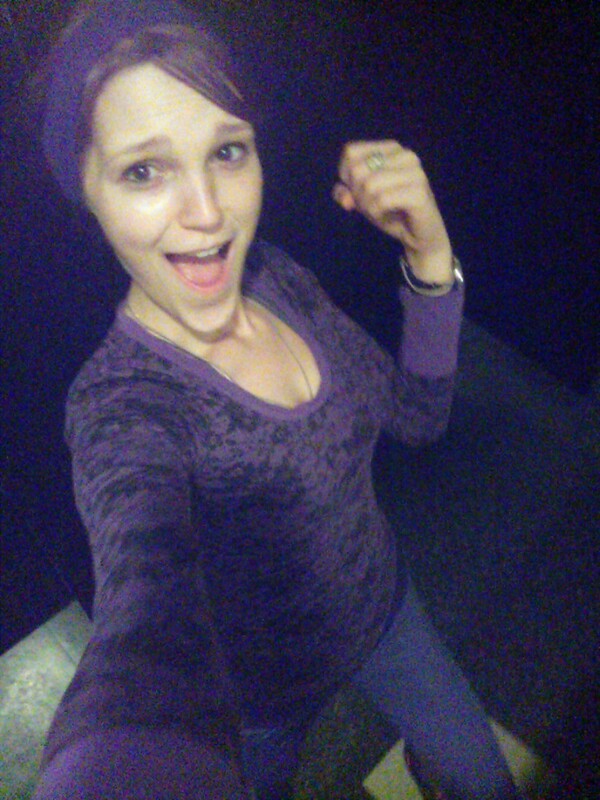 FYI: This is how excited I get for Zumba! Delaware is chilly and I need to warm up! Using Hungry-Girl’s idea, I whipped up this baby! Spray to bottom of a large pot with non-stick cooking spray. 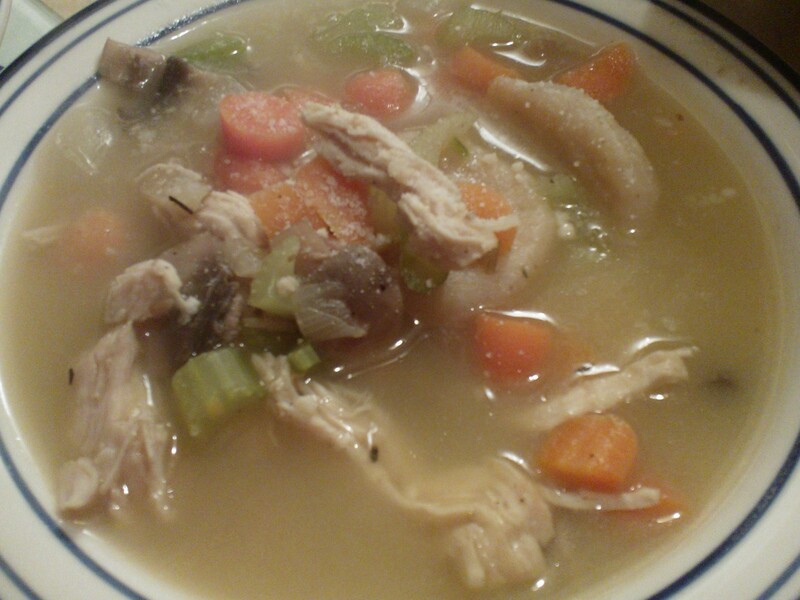 Ad celery, carrots, onions, and garlic, over medium-high heat, and cover to sweat the vegetables, about 6 – 8 minutes. 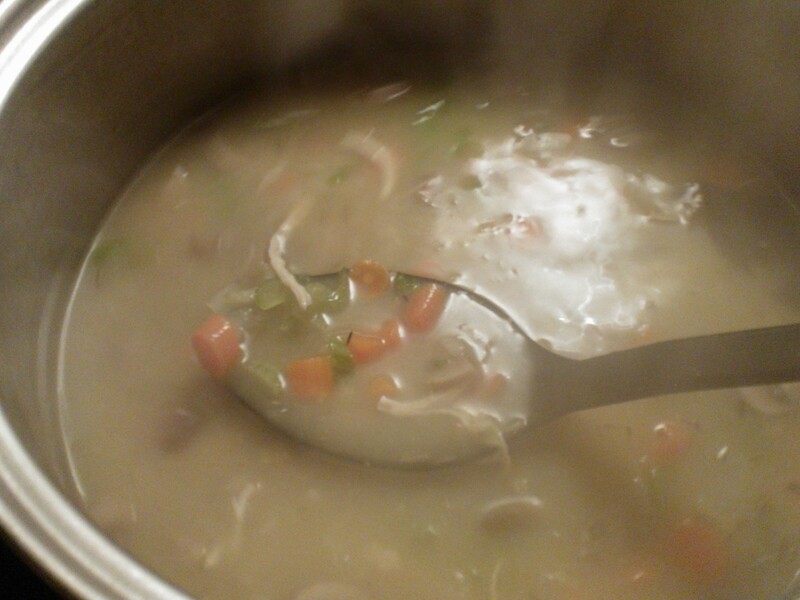 Stir the vegetables, add chicken broth, chicken breasts, mushrooms, salt, rosemary, thyme, pepper, bay leaf, and water. Cover and bring to a boil. 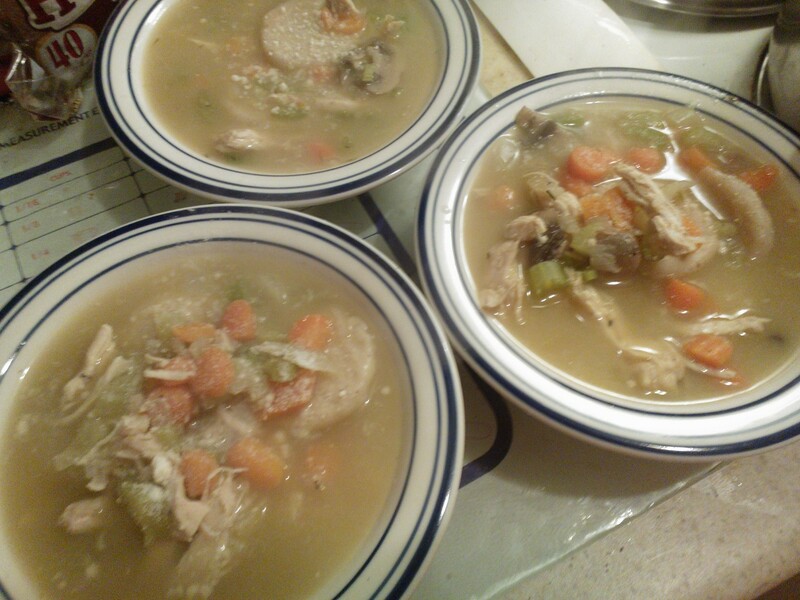 Reduce heat to low, and simmer until chicken is cooked through, about 20 minutes. Remove chicken and transfer to a bowl. Re-cover the pot, and let contents continue to simmer. Meanwhile, use two forks to shred the chicken breast. Add shredded chicken to the pot. Stir in the can of condensed soup and, optional, frozen peas. Stir thoroughly and raise heat to medium low; return stew to a simmer. While the broth is forming, preheat oven to 350F, whisk dumpling ingredients, and dollop on a baking sheet lined with parchment paper. Dollop the batter onto the baking pan (I used a cookie scoop), to get a minimum of 16 dumplings. Bake for 5 minutes, then transfer to simmering pot. Recover the pot, and continue to simmer for 10 minutes. Remove the bay leaf. Scoop 1 1/2 cup, plus two dumplings into a bowl. I topped our bowls with a little grated cheese! It was just what I needed to both warm and fill me up! I won’t lie… I kept sneaking the leftovers for the rest of the night! Its the Can-Can Sale at Shop-Rite! That means Manwich is 88 cents per can! The Bundo’s love this versatile sauce! 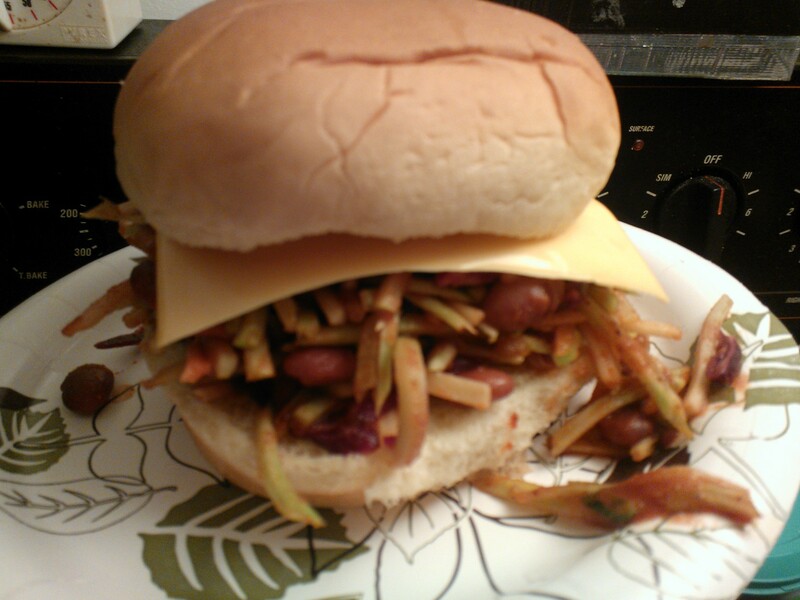 I was really jonesing for Sloppy Joes but didn’t want to deal with cooking meat. Hmmm beans are good meat alternative…. OH snap! Its January 6th! Its National Bean Day! Spray a large skillet with non-stick cooking spray. On medium-high heat, add the bag of broccoli slaw and cover. Steam the broccoli slaw for about 5 minutes. Give it a toss. Add the remaining ingredients, stir, and recover. Lower the heat to medium low and allow it to cook for 10 minutes. Eat it as is or serve it on a light bun! 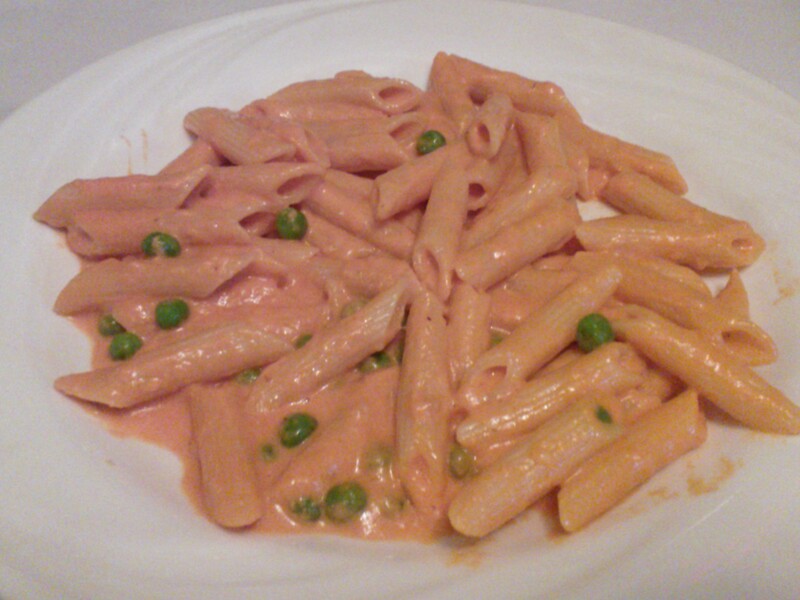 It was soooooo filling, provided great staying power, and so good, I wanted more! 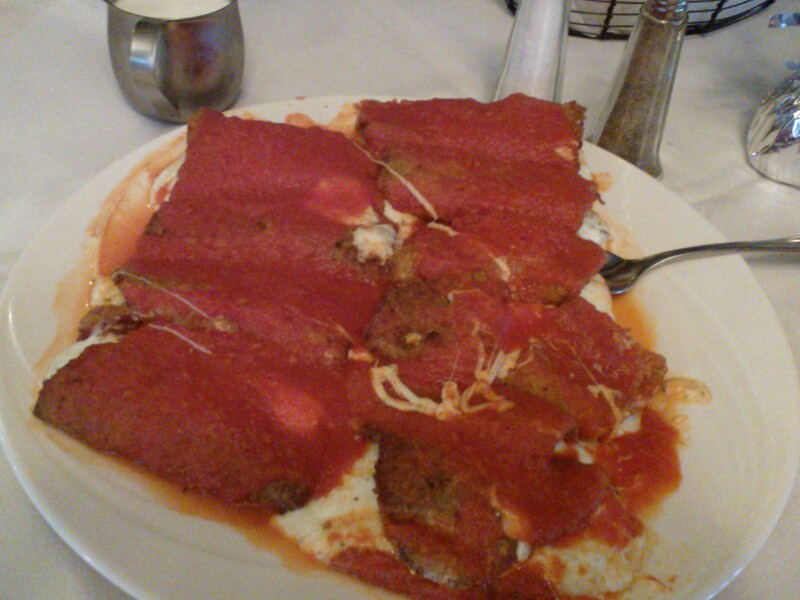 What a great option for a Meatless Monday! Welcome to 2014! I hope you all have had a wonderful start to the new year! My NYE began as it usually does… 48 hours of The Twilight Zone on SyFy! 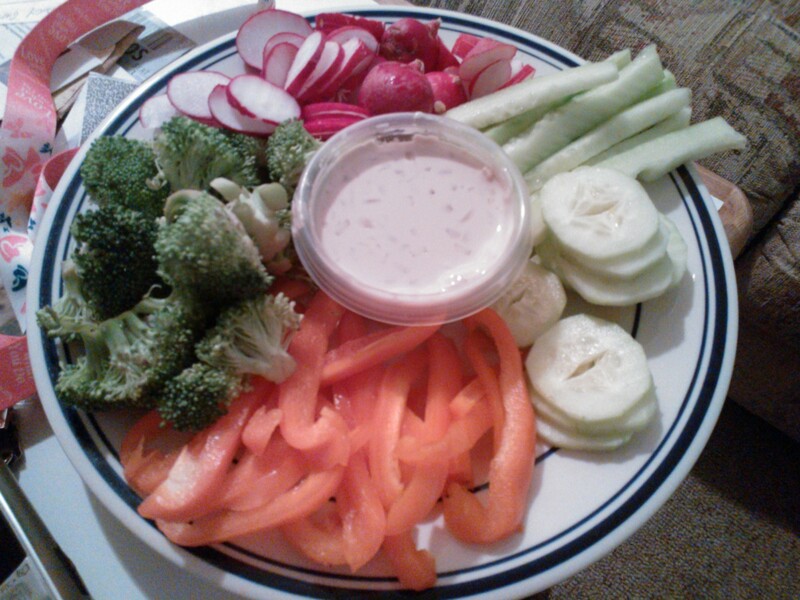 I prepared with a beautiful tray of crudite, and shrimp cocktail! I made my Mexican chicken and added beans, corn, and pepper. While I was chopping up veggies in the kitchen, I ignored the call on my cell phone. Before I knew it, dads cell was blowing up. “Sam, mom said Frank just collapsed! WHAT??!?! I turned everything off in the kitchen, threw on shoes and ran out the door to my mom’s house. 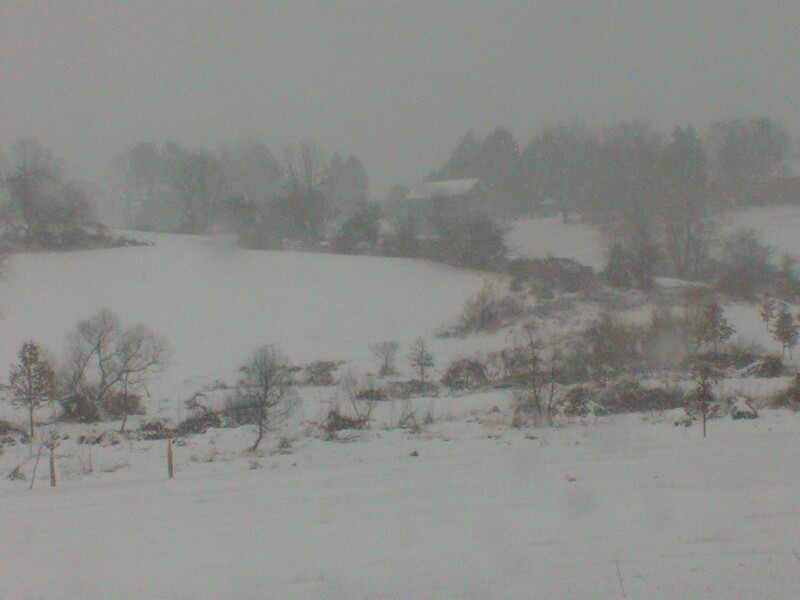 Its definitely times like these that I am thankful my parents live so close to each other! Upon rushing into the house, my mom was on the phone with 911, and I began to assess Frank. By the time the paramedics arrived, they reassessed him and his condition had worsened. I gathered his medications and loaded into the ambulance with the rest of the crew and we were off to the hospital. During the drive, his symptoms came and went. It drove me nuts! I could not tell what was actually happening! I asked his to smile. The left side of his face was drooping. I asked him to extend his arms in front of him. His left arm was lower than his right. I asked him to close his eyes . I raised his hands up and released them. His right arm stayed up, and the left arm dropped to his lap. I asked him to squeeze my hands. The left side was weaker than the right. I asked him to talk to me. His speech was slurred. His condition continued to worsen to the point where he could not squeeze my hand, he could not flex his left foot, he ignored anything on the left side, and couldn’t even feel me holding his hand. After a discussion with the doctor, I signed a consent for Frank to receive TPA, a super clot buster, within the magical 3 hours. I was terrified and torn. This is a controversial medication that has a 33% of a brain bleed. I nervously signed the paperwork, and I am incredibly thankful I did. After some hours of waiting with my brother, James, dad came to pick me up since there wasn’t much more I could do, but wait. The next 72 hours and followup CAT scans would be crucial. I arrived home to eat the dinner I had made and actually fell asleep before the ball dropped. Dad woke me up for the ball drop and I immediately fell back asleep. 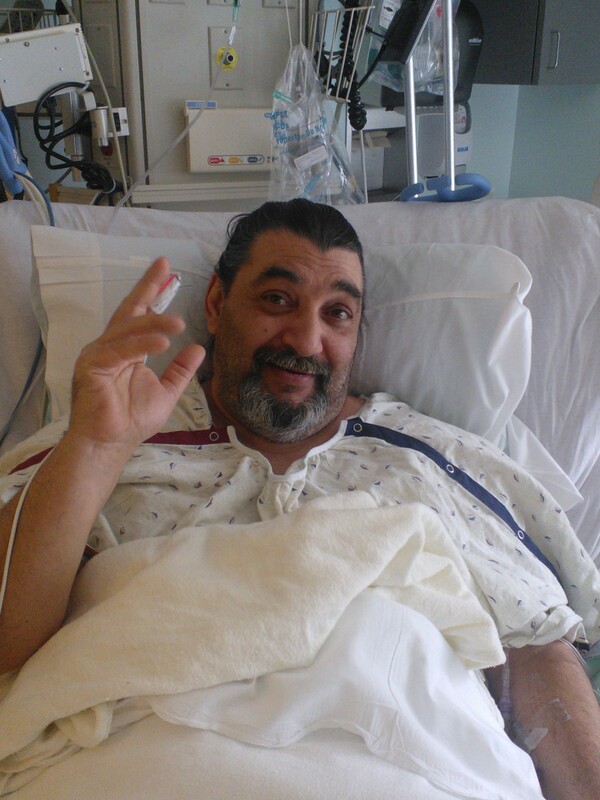 Frank was transferred to the ICU in the middle of the night and diagnosed with a TIA (transient ischemic attack). 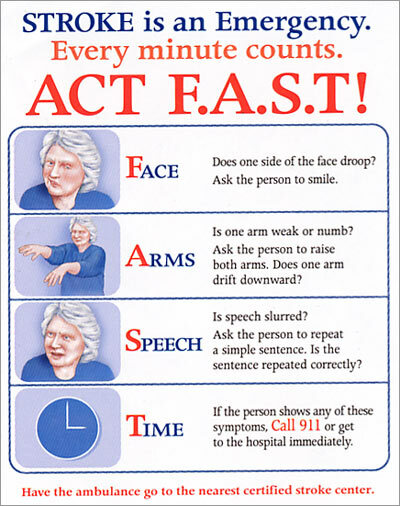 In short, its a mini-stroke that temporarily occludes a blood vessel in the brain and deprives the brain of oxygen. Frank is home now, he came home yesterday, and is back in action! We are very lucky that the attack was caught and treated quickly. He is walking and talking with only a mild weakness in his left hand, which he is working on.